“How will my face look after 20 years?” Is this question troubling your mind? You can easily get the answer to this question using “In20Years” tool. It is an online tool that allows you to upload your face image and process image as it should look after 20years. 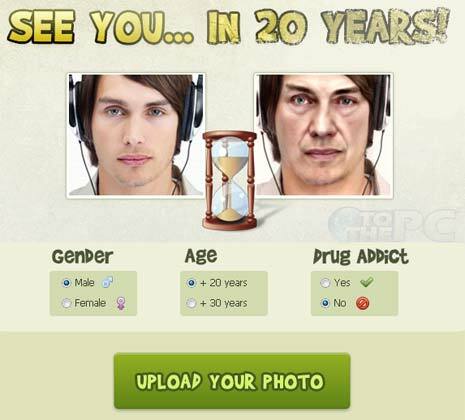 In more simple terms, this tool renders age effect to your uploaded photo. 1. Open In20Years website on your computer. 2. Select your gender and age group. Also select, if you are a drug addict or not (as addicts tend to get more aged in small period of time). 3. Click “Upload your Photo” button. Select photo on the computer to upload it. 4. After few seconds, your photo as you may appear 20 years from now should appear. You can download, save or share that photo with friends. It is more of a fun tool like online tool to see how your future baby will look like? oh……my god……..my face is bad…..i’m afraid by my face……. This software did not work at all for me it only distorted the image I uploaded I still had the same looks though brown hair an all and it was supposed to be me at 88 what a laugh. I just want to say this app is crap….they use a photo of some old women with a bulbus nose and thin lips and a bottom fat face then stretch your features to fit hers and how i found out i used my sons face and her face was in the middle of his so the result had 2 eyes nose etc this app is not accurate and not a good indicator of what you will look like in 20 years dont sweat it because everyone is going to look fuggly using this app the best indicator is too look at your parents and how you take care of your self if your parents are 30 and have great skin and you eat right and stay fit and sleep appropriatly well lucky you if not well hello saggy bulbus bums you only have your self to blame. How will my face look when iam 20 year old. It is some what new looking after 20 years!!!!!!!!!!!! Hi babes this website is well fit! love it!!! oh i hate this old picsss!!!!! it looks like you’re a witch right??? hahaha!!!!!!!!!!! !